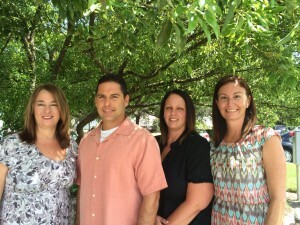 IMPOWER’s Adoption Team To Be Recognized as an Angel in Adoption™ at National Event in Washington, D.C.
Melbourne, FL – September 30, 2015 – The Congressional Coalition on Adoption Institute (CCAI) will honor IMPOWER’s Adoption Team as an Angel in Adoption™ at an awards ceremony on October 6 and gala on October 7 in Washington, D.C.
IMPOWER’s Adoption Team, nominated by Congressman Bill Posey, is being honored for their dedication and commitment to achieving permanency for children in Brevard’s child welfare system. Since 2006, the team comprised of two adoptions coordinators, Dana Whitson and Tina Reina, Adoptions Recruiter Bill Marallo and Supervisor Amanda Dawson, have worked to provide permanency through the adoption process and identification of a forever family for children in need. Together they have had tremendous success as the contracted adoptions provider for Brevard County managed by Brevard Family Partnership and continuously exceeded annual state adoption goals. To date they have helped to finalize more than 700 Brevard County child-welfare adoptions. “This is a wonderful honor for our Adoptions Team who work diligently and expeditiously to gather input, engage children to develop rapport and assess and identify needs as well as their desires in an adoptive family. Their commitment to the entire adoption process contributes to their success”, states Anna Baznik, President/CEO for IMPOWER. IMPOWER, a 501(c)(3) mental health and child well-being organization focused on inspiring life’s potential, has been serving children and families in the Central Florida community since July 1994. Service areas include Brevard, Orange, Osceola, Seminole, Volusia & Polk Counties. Our mission is to change lives by protecting, counseling, teaching and inspiring individuals and families to reach their full potential. Our programs are community based and focus on ensuring that all individuals served have the tools and support to attain independence and self-sufficiency. We provide a continuum of behavioral and mental health therapy, foster care and adoption services, independent living and transitional housing for foster youth, and tele-health/tele-psychiatry services for more than 9,000 individuals and families annually. For more information about IMPOWER, visit www.impowerfl.org. CCAI is a 501(c)3 nonpartisan organization dedicated to raising awareness about the tens of thousands of orphans and foster children in the United States and the millions of orphans around the world in need of permanent, safe, and loving homes through adoption. CCAI was created in 2001 by the active co-chairs of the bicameral, bipartisan Congressional Coalition on Adoption, one of Congress’ premiere caucuses. The goal of the caucus is to eliminate policy barriers that hinder these children from realizing their basic right of a family and more effectively raise Congressional and public awareness about adoption. The Angels in Adoption™ Program was established in 1999 as a Congressional press conference to honor outstanding individuals. Since then, the program has developed into a yearlong public awareness campaign, culminating in an extraordinary awards gala and celebration in Washington, D.C. For more information, visit www.ccainstitute.org or www.angelsinadoption.org.